Back to reality and the first three levels of the four on offer by the globally syndicated and circuit-based motorcycle training facility, California Superbike School, follow their own set curriculum. It’s the same training regime wherever in the world you do it. Level 4 however is custom designed based on the skills the individual wishes to develop using any of the 15 drills taught during the previous three levels. Plus, exclusively to level four, the on-track rider coach provides video footage for the off-track consultant to analyse and talk you through after each of the five on-track sessions. BikeSocial’s social media specialist, Chris Newble, and I have both completed the first three levels but Chris has far less track experience than I, so here are our separate views on level four. BikeSocial’s Michael Mann and Chris Newble offer an overview of what Level Four of the CSS is all about. Just like the first three levels, the entire day is a professional and dedicated process to ensure the time spent on track for the five 20-minute sessions provides invaluable skill learning. Each hour is divided into three x 20-minutes sections with initial feedback from your Rider Coach followed by a session with the Head Rider Coach who will interpret the video coverage before discussing what the next session should entail. You’ll talk through what you’d like to achieve with the off-track consultant who’ll form a plan before you head to the track. Students from each level are mixed together in each of the three groups plus the half-a-dozen rider coaches, all riding by the same gear and brake rules. So, for session one, we all were equally paced while using one gear and no brakes – on one hand a little frustrating to be sitting on a potential of 211bhp but on the other hand rather convenient given the ropey weather. For me it was all about front-end feel under braking to erase as much rigidity in my body as possible so as not to upset the bike. Also, body position when picking the bike up out of a corner such as Druids or Graham Hill Bend by putting more emphasis on the inside leg and therefore easing the weight on arms. I had a chat with Badger, my non-riding coach, about session 2 and he wanted me to repeat the Change Lines Drill from an earlier level to move the body positioning on to find the sweet spot between knees being too tight and too loose against the tank. Rather than going through each session individually, I’ll round it up. In essence the aim of the game is for the rider coaches to pick out of your riding areas where you can improve, whether it’s something you’ve noticed in your own riding or not. I found that by moving around less on the bike during such a short lap as Brands Hatch Indy is, that I was less fatigued and able to concentrate on picking my braking marker and honing turn-in points, apexes and making sure I was looking for the corner exit instead of expending so much energy by reducing the amount of physical movements. By doing what I needed to do at the right time allowed me to reap the rewards of feeling smoother, faster, more in control than rushed, sporadic and a bit last minute. The little tips like when under hard braking in a straight line, squeeze the tank with the knees to take some of the pressure of the arms making them less tense and not putting as much force through the handlebars. Every rider who has completed Levels one, two and three. And by virtue of having completed the first three levels, the fourth becomes a fine-tuning day to hone those skills that need refining, regardless of experience. Just because level four is the final one and therefore perceived as the highest tier it doesn’t mean it’s only for pro racers. The rider coaches are highly skilled beings who are not only controlling their Ducati’s and are able to lap faster than pretty much anyone on track but they can do so while picking up on the slightest points in your riding that need fixing. Oh, and using the applicable hand signals at the same time. I gobbled up as much feedback as I could, making notes and noticing the way I felt at ease with the bike in the final couple of sessions, making everything I’d learned or refreshed make sense. A fellow student commented on the noticeable speed I’d carry down the start/finish straight having got around Clearways cleaner and faster thanks to the early set-up for the corner and the stability of the bike allowing me to focus on my apex, exit and ultimately, modulating that acceleration. Plus=, it feels mega when the bike starts to squirm over the rippled surface of the Brands Hatch start ‘straight’, particularly on the beautifully equipped Panigale! How does it relate to road riding? There are plenty of observation-based skills and drills to take away from the CSS Level 4 just like the previous three levels. 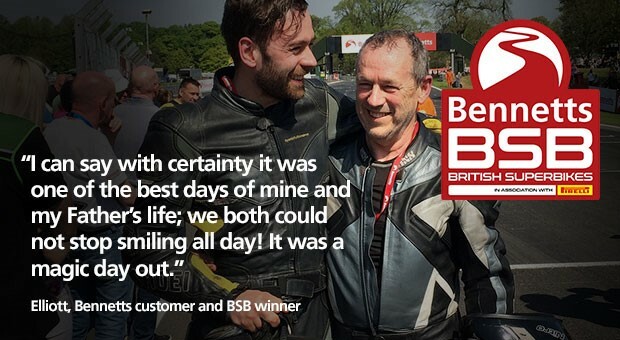 Many of the lessons learnt are transferable to the road making every rider smoother and safer by planning ahead and making sure the bike knows what you want it to do and where you should position it. Name and location: Chris Newble, Maidstone in Kent. Your usual ride: 2017 KTM RC390. Riding experience: Novice rider, 2-3 track days a year. Why did you book: Keen to improve cornering and learn how to confidently adjust body position pre and post corner without making the bike unstable. What you got out of it, and was it what you expected: I went into the Level 4 day still on a high from my previous levels. My main goal this year was to improve my body positioning on the bike and Level 3 had already equipped me with the skillsets to start achieving this. So, for me Level 4 was all about refining those techniques and working with my coaches to really put these into practice. As in the previous levels my on-track coach followed me in every session to access my riding. He would then overtake to show me where I could improve on areas such as my approach to corners and my positioning on the bike when doing so. But on the day, it was the off-track coach and the ability to watch my sessions back, using their on-board footage, that really unearthed some gems. It was the first time I had ever done this style of coaching and it was really eye-opening. He could visually point out key areas where I wasn't applying certain techniques and at the same time I could ask him why I was struggling with certain corners. Throughout the day we progressed through my worst sections of the circuit and by the end of play I was not only feeling more comfortable on the bike, but I found the circuit far less intimidating. I'm now excited to go away and not only hone these skills on the road, but also continue to practice them on future track days.